We explain how payment gateways work, how they relate to PCI compliance and how you can securely process credit cards online with payment gateways using TransNational Payments. What Is a Customer Vault? Payment Gateways vs. Payment Processors: What’s the Difference? A payment gateway allows merchants to accept credit card payments by facilitating a secure payment transaction through the transfer of information between a payment portal (think your website or mobile phone) and the front-end processor. Gateways are payment services that process credit cards online through an e-commerce site or in person through a credit card terminal. How do you choose a payment gateway? Thousands of GOOD options. For the BEST one, ask a reputable merchant services provider like TransNational Payments. 1. What’s the difference between a virtual terminal and a payment gateway? Payment gateways let you accept credit card payments (in person or online) by transferring money between your merchant account and a payment processor. A virtual terminal turns your computer into a credit card terminal and allows you to manually process payments right from a web browser. It’s great for remote billing or taking credit cards over the phone. Virtual terminals are ideal for businesses that don’t need an online store but do need to accept remote payments through phone, mail or fax. 2. What’s the relationship between merchant accounts, payment processors and payment gateways? the bank account for your business). With traditional credit card processing services, you cannot take payments until after you apply and are approved for a merchant account. A payment processor is the bank that actually processes the payment request. When customers pay with a credit card, payment gateways connect merchant accounts with payment processors by transferring credit card information between the bank that issued the credit card and the bank account for your business. 3. How do payment gateways automate businesses? can help automate your business, such as recurring billing and reporting. The recurring billing feature stores your customers’ information and allows you to automatically charge them on a recurring basis. 4. What’s the difference between a payment gateway and a payment switch? The payment switch is part of the payment gateway and is responsible for making sure incoming payment requests (transactions) are directed to the right place. When the payment gateway receives a payment request, the transaction is routed to the payment switch (this process is called “transaction switching”), then the switch routes the transaction to the correct issuing bank for approval. 5. If I already have a payment gateway provider do I still need to worry about PCI compliance? Yes. All merchants who process credit card information must be PCI compliant, and having a PCI compliant gateway is only one part of that requirement. Fortunately, if you use TransNational Payments as your payment processing system, you are PCI compliant. TransNational Payments will ensure that your business is properly operating under the specified guidelines of PCI, using only PCI certified POS systems or devices and provide ultimate protection to your business and its customers. Ready to start accepting payments online? A payment gateway is an affordable way to experience the benefits of e-commerce. A virtual terminal is the link merchants need to accept credit card and ACH payments online securely and efficiently from their own computer. A virtual terminal can be used to process credit card and ACH transactions from any computer with internet access anywhere in the world, allowing you to securely and efficiently handle a series of additional tasks including the verification, reporting and processing of credit card and ACH payments. Virtual shopping carts allow visitors to your website to choose items for immediate purchase or to be stored for later purchase. Virtual shopping carts facilitate the collection of billing address, shipping address and payment information to be processed by a payment gateway, which can be integrated with various shopping carts. Turn any internet browser into a credit card terminal. Simplify today's transactions with a payment gateway — no extra equipment needed. The customer vault, like TransNational Payments’ customer vault, allows merchants to transmit payment information through a Secure Sockets Layers (SSL) and process transactions without accessing cardholder information directly. Said another way, the customer vault securely stores customer information, including payment methods. The customer vault allows transactions to be processed for repeat customers, without the need to re-collect billing information and without the need to store billing information in your system. If you use TransNational Payments’ recurring billing, customer information must be stored in the payment gateway customer vault. You can also use it for non-recurring transactions so your customer doesn’t need to re-enter their information each time they make a purchase. "I've purchased here before. Don't you already have my information?" Use a customer vault and run sales for repeat customers without re-collecting billing details. Recurring billing solutions, such as TransNational Payments’ recurring billing solutions, allow you to automate your billing procedures for a simpler payment process and steady cash flow. Recurring billing is great for an array of business types who want to provide secure and easy ongoing payments for their customers on a periodic basis. Recurring billing (recurring payments) is a perfect solution for customers who want to automate their monthly payments and great for small business owners who do not want to have to worry about late payments. Some prime examples include gym memberships, cable bills, electric bills, subscription-based services and more. If you have a customer that purchases something for your business on a frequent basis, offering recurring billing might be a great solution for them. To set this up, a merchant is required to get their customer’s permission upfront to run their card one time, store their information, and then continue to withdraw a specified payment on an on-going schedule. What are the benefits of recurring payments for my business? What are the benefits of recurring billing for my customers? Make late payments from your customers a thing of the past. Set and forget! Recurring billing simplifies membership fees, bill payment and more for everyone. Recurring payments help you get paid faster and are easy to setup. Watch our recurring payments video to see how easy it is to setup. Still have questions on recurring billing? We've got answers on all the features included in a payment gateway. Our online payment gateway also offers fraud screening tools to reduce the risk of fraudulent transactions. Fraud screening tools include: Address Verification Service (AVS), card code value (CCV) and card verification value (CVV). An internet payment gateway also helps prevent fraud and reduces your liability by storing the credit card transactions in the gateway (instead of on your website, also known as your customer vault). Don't settle for less. Choose a payment gateway with built-in fraud protection. With 20 years of payment leadership, we don't mess around with small business fraud. A payment gateway is an e-commerce service that processes credit card payments for online and traditional brick and mortar stores. Payment gateways facilitate these transactions by transferring key information between payment portals such as web-enabled mobile devices/websites and the front-end processor/bank. Payment gateways fulfill a vital role in the e-commerce transaction process, authorizing the payment between merchant and customer. In essence, a payment gateway is an e-commerce service that allows merchants to accept credit card and other forms of internet transactions securely via your website. Remember, if the payment options on your e-store aren’t set up in the correct manner, you could suffer loss of orders placed on your store. This means you’ll experience a significant drop in sales because of unsatisfied customers. Implementing the right payment gateways however, can prove key ensuring long-term success of your online business. Since not all the payment gateways functions in the same manner, it’s crucial to make the right choice. Open your online store effortlessly. You don't need to be a tech expert to benefit from a payment gateway. Payment Processors vs. Payment Gateways: What’s the Difference? If you are a business owner, the terms payment processor and payment gateway are likely not foreign to you. In fact, they are likely something you have spent quite a bit of time thinking about it. However, understanding the difference between the two may at times seem complex, but it doesn’t have to be. A payment processor analyzes and transmits transaction data — essentially they are responsible for sending payment data from the merchant to the issuing bank and then to the acquiring bank. Traditionally, a payment processor would furnish you with processing equipment such as your credit card machines and so on. This is the payment solution that you are most likely already acquainted with. A payment gateway is very similar to a payment processor in that it is a tool that transmits payments between the customer’s bank and yours. The main difference however is that it is primarily used as a tool for e-commerce or card not present transactions. In other words, it is essentially a point-of-sale terminal for online transactions. A payment gateway is often one of the services offered by a payment processing company, such as TransNational Payments. However, the downside is that not all payment processing companies offer them. Still have questions on payment processors vs payment gateways? We can tell you if a payment gateway or a merchant account is right for your business. Payment gateways encrypt data using SSL before sending it through the credit card network to protect the buyer’s sensitive account information. This means the buyer’s credit card information is coded in a way that makes it difficult for criminals to access it as the data is communicated between the different participants in the payment chain. PCI compliance is a security checklist created by the Payment Card Industry Data Security Standard (PCI DSS) to help reduce fraud. All organizations that process credit and debit card payments, and all merchants that accept card payments, are responsible for their own PCI compliance. 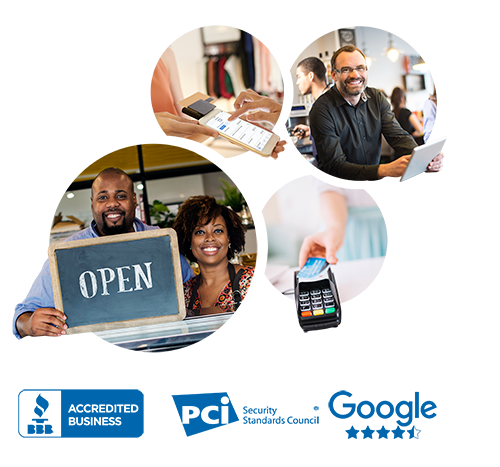 For a variety of reasons, merchants often end up cobbling together a payment processing system from a number of different companies. They might use a payment terminal from one vendor, payment gateway from another, and a point-of-sale system from a third. While each individual product or service might be PCI compliant, it doesn’t guarantee that the merchant, as the entity accepting card payments, is PCI compliant. That’s because PCI compliance pertains to the entire payment landscape, which includes how merchants process payments, how merchants connect those systems and how merchants manage their customers’ data. TransNational Payments will ensure that your business is properly operating under the specified guidelines of PCI, using only PCI certified POS systems or devices and provide ultimate protection to your business and its customers. Accept payments online and more with our easy payment gateways for merchants.